Direct purchasing of your precious metals is a great way to enter the market. Holding physical precious metals in your hand is a unique experience that puts the concept of investing in a new light. Guildhall goes beyond offering great pricing for precious metals. We take the time to assist every client, providing personalized service. We are passionate about precious metals and are happy to answer any questions about the market or the various products available. A direct purchase of precious metals can be the best way to get involved in the market. Many investors prefer to meet in person when making their first bullion acquisition. A Guildhall representative is happy to sit down with you and answer all of your questions and assist you to select the precious metals that will best suit your needs. To insure product availability and to provide the best service possible, clients are asked to schedule appointments ahead of their visit. Guildhall representatives are standing by to assist in the purchase of your precious metals over the phone. • Review and confirm your pricing. • Receive your order confirmation. • Arrange payment methods & delivery. www.guildhallpreciousmetals.com offers on-line pricing for the direct purchase of gold, silver, platinum and palladium. Choose from a wide variety of products including several combo packages. Volume discounts are offered along with ongoing product promotions. 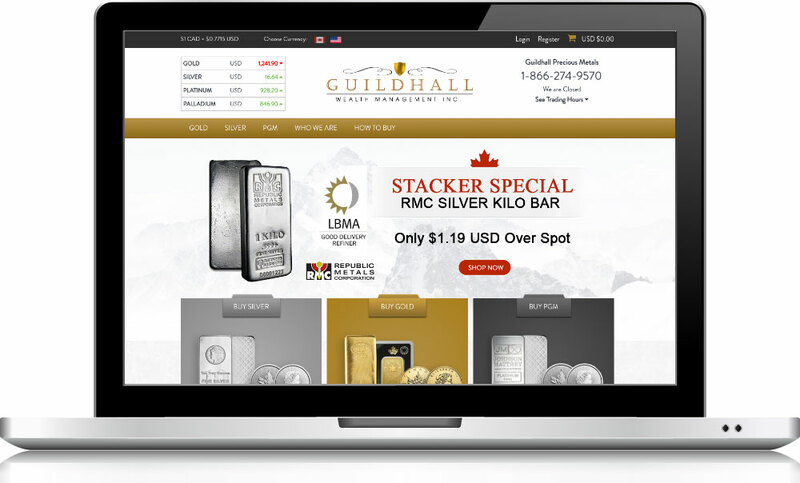 Save time and acquire your bullion conveniently with Guildhall Online. Accumulate gold and silver monthly with the Guildhall Monthly Buyer’s Club. A unique service offered by Guildhall. By purchasing precious metals on a regular basis investors can build a large portfolio over time. The Monthly Buyer’s Club is also a great way to take advantage of dollar cost averaging. Buying a fixed amount at regular intervals allows you to buy more when the price is lower and less when the price rises. Over time your average cost decreases. Guildhall offers complimentary storage while clients accumulate enough product to be eligible for free shipping. Once a price has been booked and your confirmation is received, payment must be provided within 24 hours. When payment has cleared Guildhall will immediately ship your order and provide tracking numbers where available.